A black and white photograph of a Sunday School Class at All Saints' Anglican Church Rectory located at 208 Bryon Street South. 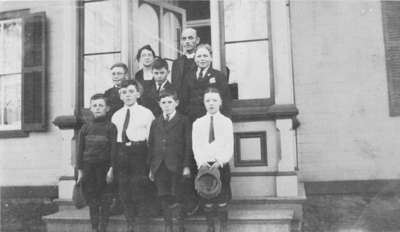 The group is pictured standing on front steps of the Rectory. Sunday School Class at All Saints' Anglican Church Rectory, c. 1925, Photographer Unknown. Whitby Archives 09-002-015.